Our objective is to provide a market leading service across a different range of technologies to ensure Indian businesses and industry professionals have current knowledge and expertise to compete in the local and global market. Diploma in Digital Marketing is ideal for anyone involved in the planning, implementation or measurement of Digital strategies – or anyone who would like to pursue a career in this area. The Professional Diploma in Digital Marketing programme is suitable for professionals of all levels and disciplines, and will prepare you to take up a more specialist role within the overall marketing domain. Students who finish the course effectively gets 100% Job Placement in one of the finest design studios and companies in Ahmedabad, Mumbai, Pune, Bangalore and other parts of India where graphic design job opportunities are available. The best part of SEO is student can make their career easily in freelancing opportunities through internet and make profit in their extra time. At the point when students are prepared appropriately we give them live projects and in house activities to make them professional. Personal to personal class room training is given to students for qualitative outcomes. Digital marketing is the most powerful form of marketing. It includes everything in online like search engine optimization, social media marketing, google analytics and adword. Individuals put stock in Google. They utilize it consistently to discover what they are searching for. By positioning high on search engines, your business will assemble trust and believability with your gathering of people. Digital marketing is marketing that makes use of electronic devices (computers) such as personal computers, smart phones, cell phones, tablets TV to connect with stakeholders. It is also known as online marketing, web marketing or internet marketing. 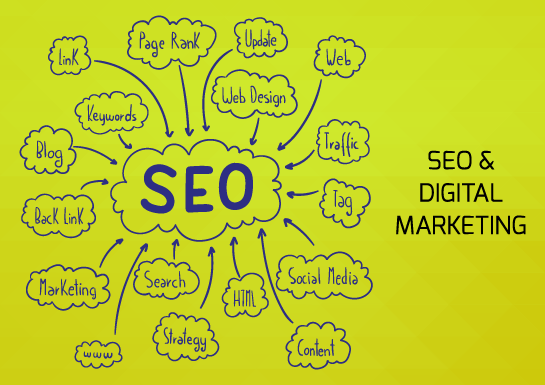 SEO (Search Engine Optimization). This course is all about optimizing a website for search engines. With this course we will focus on following topics. Business owners/Entrepreneurs to use PPC/SEM medium to instantly create Brand Awareness in Web World, attract targeted potential clients and establish your presence instantly online. Pay Per Click (PPC) or Search Engine Marketing (SEM) Google Adwords helps to yields a high ROI, giving instant visibility of any brand in the search engine space, driving targeted traffic and creating brand awareness to website. This course will give you depth knowledge on following topics. Advanced Segmentation, Custom Reporting, Flash Tracking, Create customized email reports etc. your company. What are the Google Webmaster Tools and how to start using them? How to use and integrate the Google Webmaster Tools with your web site?